Manage users across Upsource, YouTrack and TeamCity installations, use a centralized dashboard for a quick overview of the relevant commits, issues, or tests. Conduct administrative support for groups and permissions and manage licenses between Upsource and YouTrack. 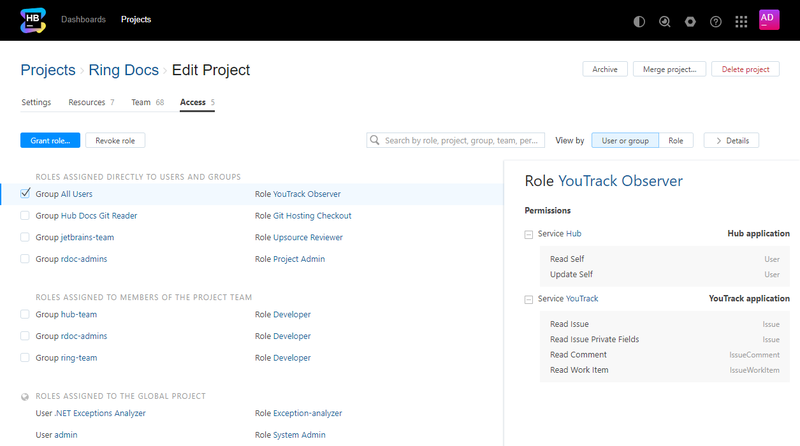 One-click navigation to YouTrack issues from discussions, code reviews, and commit messages. Hub enables advanced integration between the JetBrains team collaboration tools. For example, when you use Hub to connect your Upsource and YouTrack installations, you can create new issues directly from your code reviews. Hub makes sure that across all the JetBrains team tools used in your team, a user can log in once and stay authenticated throughout. A variety of authentication ways are supported including LDAP, Google, GitHub, and built-in authentication. Hub can also be used as an Identity Provider to log in to third-party services that support SAML 2.0 authentication. Hub manages a single database of users, groups, roles, permissions and projects, and shares it among all connected YouTrack and Upsource installations, effectively serving as an authentication and authorization server. Create a new project in Hub and apply it to your Upsource and YouTrack installations by creating the corresponding projects in both. 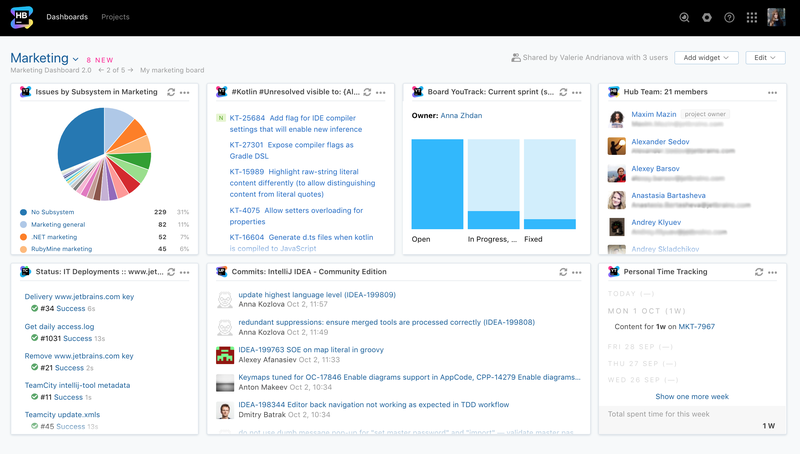 Hub provides a Dashboard to track issues, commits, build status, and code reviews in your project(s). The Dashboard pulls data from YouTrack, Upsource, and TeamCity. Extend the functionality of your dashboards by uploading and installing custom widgets! If one or several commit messages refer to a YouTrack issue ID, you can enjoy a two-way sync between YouTrack and Upsource: Navigate to the related issue from a set of changes or a code review in Upsource, and see the related changes when viewing the issue. Whenever a code review or a source code discussion in Upsource has revealed a problem that isn't practical to resolve right away, you can quickly create a new issue in YouTrack to describe the problem and plan who will work on it in the future. Whenever you're looking at TeamCity's Change Log or Change Details view, TeamCity's Hub plugin gives you a choice of using the TeamCity built-in diff viewer or one of two diff views available in Upsource. This feature will be available in the next version of Hub plugin for TeamCity. Is Hub free or must I pay for it? Hub is completely free for an unlimited number of users, with all the upgrades, forever. JetBrains Hub is a server that handles authentication, authorization, users, groups, permissions, and projects across multiple installations of JetBrains team tools. It also provides a Dashboard to display the relevant data from all the services that connect with it, and provides a way to quickly set up repositories, build configurations and issue trackers for any new projects. Finally, Hub enables some advanced integration scenarios between YouTrack, Upsource, and TeamCity. Can Hub be used by my team? You use both YouTrack and Upsource, and you'd like to manage them both in a single place. You want a single Dashboard to track issues, commits, build status, and code reviews in your projects. Is Hub available in the Cloud? 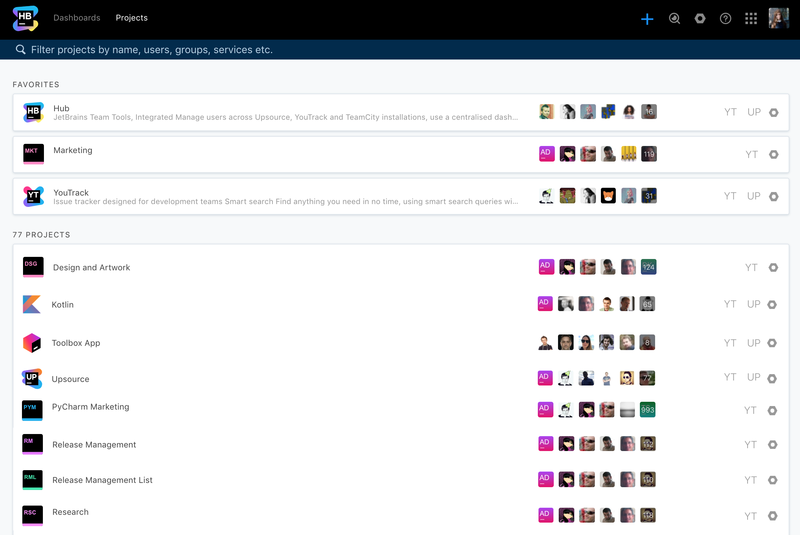 Hub is currently an on-premises tool only, similar to Upsource and YouTrack Standalone. Hub only integrates on-premises installations of the JetBrains team collaboration tools, meaning that Hub can work with YouTrack Standalone but it does NOT support YouTrack InCloud. Can Hub be used with TeamCity? TeamCity can be connected to Hub via a special Hub Plugin. It supports user authorization and provide widgets that pull data from TeamCity, such as investigations and build artifacts to the Hub Dashboard. In terms of managing users, projects, and build configurations, we're working to enhance the TeamCity Hub plugin.